On Wednesday mornings, after leaving the gym, I like to stop by the Habitat Restore. (A thrift/home supplies store to benefit the local Habitat for Humanity chapter). I frequently find fabrics, notions, and books there; always worth the stop. 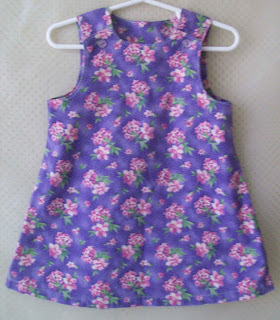 This Wednesday, I had picked up two pieces of fabric and some buttons and was headed up to checkout when I saw the little purple dress on the floor. I picked it up and started to lay across the rack, when, after a second look realized it was almost Lilly size (it might be abit big) and had potential, so, for $1.25, it was added to my purchases. After I got it home, I washed it (needed to do some laundry anyway), and hung it up to consider. Now, mind you, I'm not much of a sewer, although, one would never guess that with the two cabinets I've filled (finds) with fabric, buttons, notions and such. But, I've been meaning to start experimenting with some fabrics, so decorating a dress is as good a place to (re)start as any. Which brings me to my mother. When she was a young woman (in the early 40's), she wanted to be a fashion designer. Instead, she got married to a man who turned out to be a lousy husband and had three great kids. Later she divorced him, married my father, who also turned out to be a lousy husband, but she had me, another great kid. Well, the one constant in her life (besides kids and alot of work) was sewing. She could sew the most wonderful dresses. 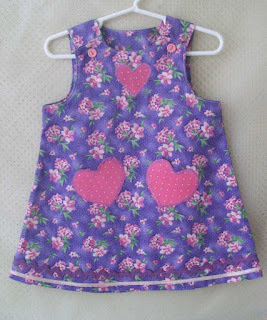 She could often sew without patterns, or alter them to meet the requests of her daughters. Did I mention wonderful dresses? Well, except for one thing; RICKRACK. She'd had a thing for rickrack and she could take a garmet that was going so right, and then, before our very eyes, add on the dreaded RICKRACK. Now, as a small child, I'm sure I didn't care, but by the time I reached early teens, enough was enough! But still, she presisted with the rickrack. In the end, I had to get little jobs so I could buy my own clothes ... devoid of rickrack. So, there I am in my room considering a row of purple RickRack, which probably had humored me when I picked it up at some yardsale. But, on it went .... a row of RickRack. Decided I'd better stop at this point. I think this may be a little big for her; will find out next week. AND, Dear Lilly .... I'll really try not to put RickRack on your clothing past the age of 8. I promise.